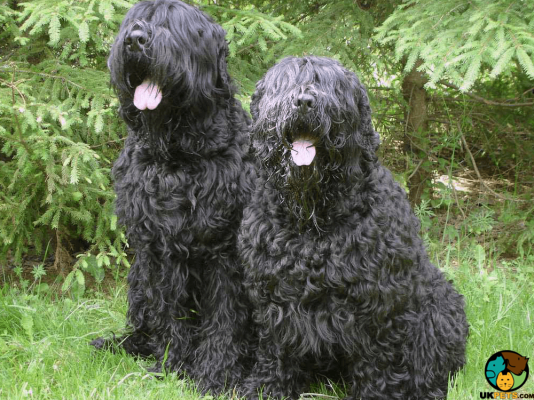 Searching for a Russian Black Terrier? The Russian Black Terrier, also known as the RBT was bred by Russian soldiers at the end of World War II. It is a loyal, courageous and confident dog that is not suitable for new owners. It builds a strong bond with its owners and will tend to be overprotective. It is recognised by The Kennel Club under the Working group. 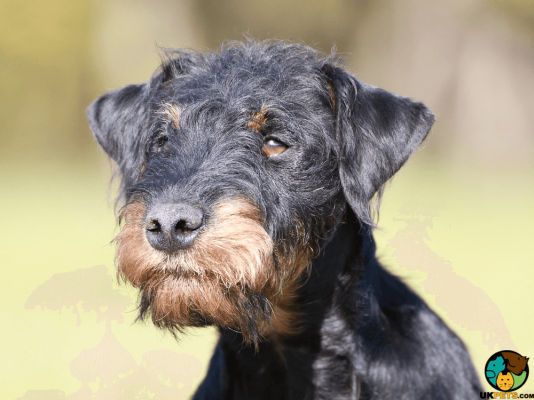 Has the Russian Black Terrier caught your attention? Here is a brief background of this loyal Russian dog. The Russian Black Terrier was developed during the Cold War by Russian army scientists with the intention of creating the perfect dog that could withstand extremely cold weathers. Records show that there were a total 17 breeds used to create the RBT including Rottweilters, Giant Schnauzers, Airedale Terriers, Great Danes, and some local dogs. The Russian Black Terrier was exclusively bred by Red Star Kennel under the supervision of the Red Army. The breed worked alongside soldiers mainly chasing intruders. Later on, it worked at prisons, rail crossings and other military venues like gulags (Soviet forced labor camps). When the gulags closed in the 50s, there were an excess of the RBT, forcing them to sell puppies to the public. The first breed standard was set in 1958. It earned a good reputation for being a loyal and even-tempered companion and family pet. In spite of this and the fact that it is recognised by major dog registries, it is not yet a familiar breed in other countries, and only a low number of RBT puppies are produced worldwide. The Russian Black Terrier is a large, imposing dog that weighs 80 to 140 pounds and stands 66 to 77 centimetres at the withers. It basically looks like a larger version of the Giant Schnauzer. It is a well-proportioned dog that is strongly built with a heavy bone. Its head is suitably proportionate with a broad and flat skull, a moderate stop, and a muzzle that tapers slightly toward its nose. It also has a strong jaw with a perfect scissor bite, a large nose, oval-shaped dark eyes with tight fitting dark eyelids, triangular pendant eyes, and thick black lips. Its hardy body is almost square. The RBT is adorably covered in a weather resistant double coat, which is not soft or wiry. The hair looks broken and slightly waved when it is brushed. It has a dense undercoat and boasts of delightful eyebrows, whiskers and beards that square off its muzzle. According to KC standards, the accepted colours are black and black with grey. 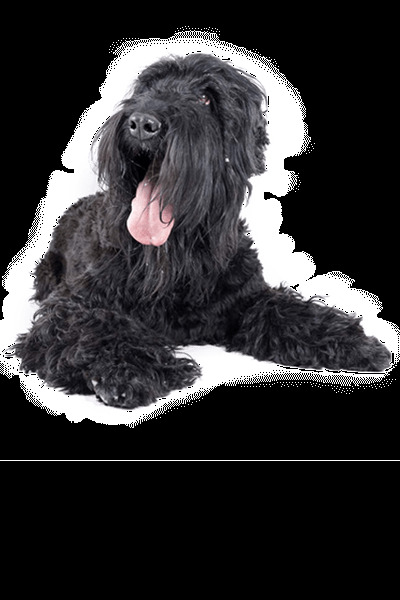 The Russian Black Terrier’s double coat is high maintenance and owners need to brush it every day to avoid matts and tangles. Special attention should be given to the muzzle where food usually gets stuck to the whiskers and beard. It sheds minimally throughout the year but heavily two times a year, during spring and autumn. It nails should be trimmed when there are clicking sounds on the floor, teeth brushed at least two times a week, and ears cleaned to avoid too much wax build-up. The Black Russian Terrier is a confident, courageous and even-tempered dog that is famous for being emotionally stable. As a military dog, it is loyal, self-assured and aloof toward strangers but never aggressive. It is not recommended for first-time owners because it needs guidance from an experienced owner who knows how to handle this type of dog. Training and socialisation should start as soon as the puppy arrives and would need constant attention and guidance and may become withdrawn if it feels ignored. If you live in a busy household where all members are out most of the time, this dog is not for you. It suffers from severe separation anxiety and may become restless, which can trigger unpleasant behaviour. The BRT builds a strong bond with its owners, including children and would protect them with all its strength. It is important to curb overprotective tendencies and teach it good manners. This breed is smart and will have a tendency to be strong willed, but because it loves pleasing its owners, it is highly trainable. However, owners need to establish its alpha role so the Black Russian Terrier will know its place in the pack, which is below everybody else in the household. Russian Black Terriers love children of all ages and are gentle toward them. However, adults should be cautious during interactions, so no one accidentally gets hurt when play becomes too rowdy. It is also important to teach the RBT that the kids’ friends are not a threat, so there is no need to be overprotective when they visit the home. The breed can get along with other pets it grows up with, but males are often described as “off” when meeting other male dogs. It is better not to introduce new pets, big or small to an RBT to be on the safe side. Whether home-cooked or commercial dog food, the number one ingredient for this large energetic dog’s diet should be meat. It is important for it to stick to an eating schedule and avoid free-feeding. When you choose to prepare its food, ask your vet for supplements to prevent nutritional deficiencies. If you opt for commercial dog food, choose trusted brands with limited ingredients and stir clear of those with fillers like soy, corn and wheat. The Russian Black Terrier is a generally active dog with an average lifespan of 10 to 11 years. However, you have to watch out for certain health issues it is prone to develop such as Hip and Elbow Dysplasia, Otitis, Progressive Retinal Atrophy, allergies, and ear infections. While it does not mean that your RBT will suffer from any of these illnesses, they are all worth knowing. The RBT is a large, active and intelligent dog that needs at least 2 hours of exercise every day. When its physical and mental exercise needs are not met, it will display unwanted behaviour such as becoming noisy and destructive. Since it was bred as a working dog, it will not be content with daily walks. Make sure to give it mentally stimulating activities like jobs or playing interactive games. 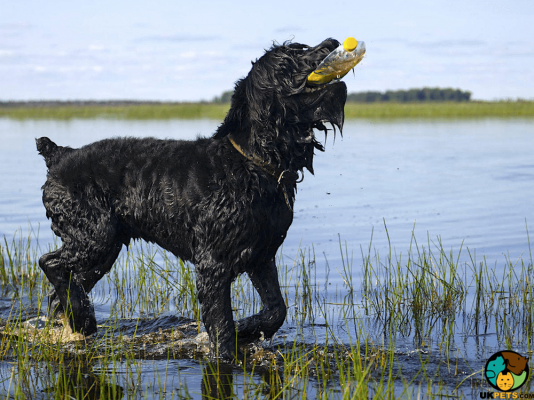 Owning a Russian Black Terrier can be expensive because it is a large breed with a lot of needs. 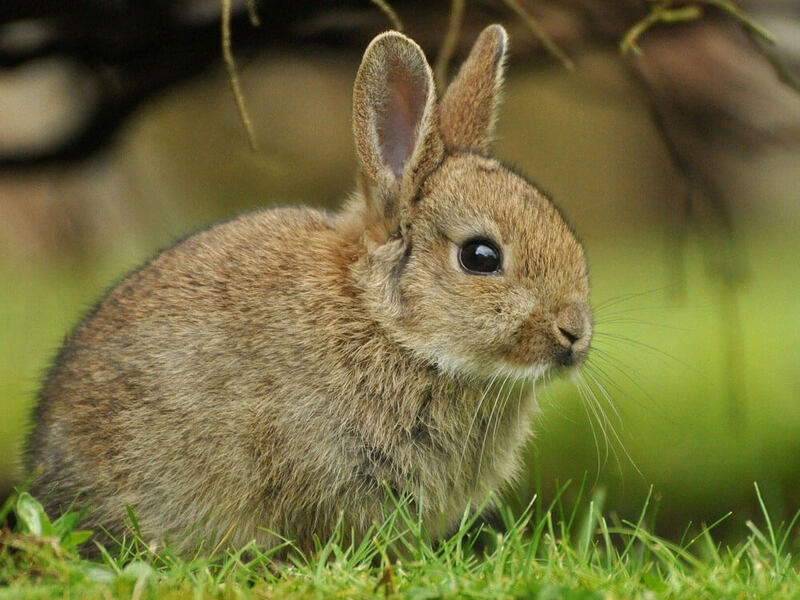 For starters, obtaining one can be tricky since it is a rare breed in the UK. You need to be on a waitlist and the price to buy a well-bred RBT does not go lower than £1,500. Insuring this breed will cost you around £50 but since the price depends on the company and the coverage, make your research on the best offers for this breed in your area. Basic equipment like crate, bed, dish, toys and others will be around £250, while monthly food cost will set you back £40 to £50. Veterinary expenses composed of routine check-ups, vaccinations and other preventive treatments can set you back £1,400 a year. 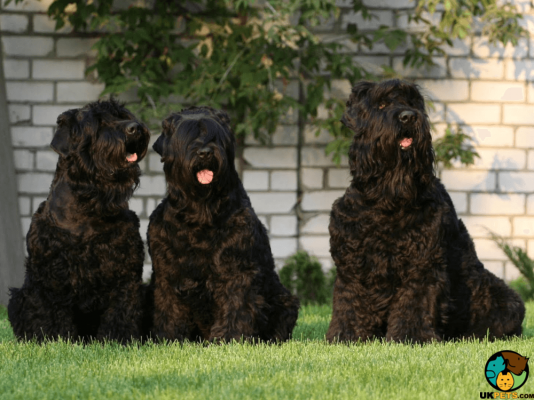 Is a Russian Black Terrier Right for You? The Russian Black Terrier is a courageous and loyal dog bred by the Russian military. It is not for first-time owners as it needs an experienced and firm leader it can go to for guidance. The RBT has high grooming needs. It builds strong bonds with its family leading it to suffer from separation anxiety. The breed needs at least 2 hours of exercise per day.